Pineapple is one of my favorite foods, but I used to find it difficult to peel and slice it. It was a big challenge. I loved eating this delicious tropical fruit but was unable to eat it as much as I like because of the challenge that comes with it. Not anymore, as I have found the best pineapple corer which made the task of slicing the pineapple easier. How Does a Pineapple Corer Work? 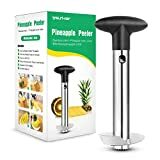 How to Pick the Best Pineapple Corer? Pineapples are wired. Do you know that it takes ﻿﻿﻿﻿﻿﻿﻿two years or more for a pineapple plant to bear its’ first fruit even in the most optimum growing conditions. And, one pineapple plant can produce only one pineapple at a time? People generally find it difficult to cut into a pineapple as the prickly outer layer and the hard-core really gives a tough time. Therefore, they prefer to pick canned pineapple instead of investing in fresh fruit to skip the messy and complicated process of cutting and slicing the fruit. But what if I tell you that there’s an easy way to cut into the fruit and enjoy it too? Instead of picking up the expensive pre-packaged or pre-cut pineapple, you can choose a better option available out there. Not forgetting to mention that canned pineapple is not healthy too. Still thinking what it is? Well, the answer is a pineapple corer. 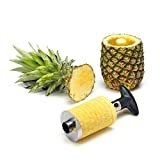 Not only does this kitchen appliance make it a breeze to cut into the pineapple, but it also makes the fruit look way better and appetizing. After using this amazing kitchen tool, you will get your hands on beautiful yellow rings that look like a professional chef has created them. If you still have not got your hands on a pineapple corer, don’t worry as I will explain to you how it works. It operates in a simple manner. Start by cutting off the top of a pineapple. Use the measurement feature in the appliance and figure out how far are you required to take the corer into the pineapple. Here make sure you leave some space at the bottom to avoid piercing the bottom. Place the blade in the middle and move it down to the point you have measured. Hold the fruit firmly with one hand and use the other hand to hold the pineapple corer. Pull it down till you reach the bottom and remove the fruit. Push the release button and slide off the pineapple rings off the tool. By using one of the best pineapple corers featured below, many consumers have found that the pineapple corer has helped to minimize waste compared to manual cut. Manual cut usually lost quite a significant amount of the pineapple flesh when slicing off the pineapple’s skin. The previous purchasers also commented that the corer a highly efficient product to slice the otherwise prickly fruit. Here is a quick video showing you how to use a pineapple corer effortlessly. The corer should be made up of stainless steel body and blade as it lasts long and helps cut into the fruit with ease. The cheaper model comes with regular steel blade which can quickly lose it sharpness after a few use. The pineapple skin is very tough, so you need a product that can easily handle all the force that is required to cut it. While you may get your hands on a number of plastic models, you must remember that they don’t last long. Moreover, they are not a good option for the environment too as they are easily spoiled and end up in the trash which contributes to the landfill. Apart from the material, the next important thing that you should consider is the blades. The corer should have sharp blades made up of high quality steel. Therefore before you make a purchase, make sure to read reviews left by previous customers or look for product reviews. If blades are not sharp, they will not be able to cut the fruit precisely and will leave you with ripped pieces instead of rings. With dull blades, a lot of fruit, as well as the juice of pineapple, will be wasted. 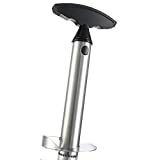 Since the corer is required to be twisted for a majority of the time, it is important to pick one up that comes with a comfortable yet sturdy handle. The slicer is required to be twisted into the fruit to get the rings, and a handle that is not sturdy will make things difficult for you. There are a lot of pineapple corers worth considering, but here are our top 5 picks that will make it easy for you to cut pineapple and enjoy it. While a lot of previous buyers liked using this tool, there were some who were not able to get it work because without much strength; you won’t be getting the perfect pineapple rings. However, for those with muscle, this corer one the best pineapple corer and yet very cheap in price. If you are looking for a simple and efficient way to slice pineapple, then look no further. The Super Z Outlet stainless steel pineapple de-cutter is a user-friendly product that can be trusted to give good results. Made up of stainless steel, it is highly durable and does not corrode or rust. If you are looking for perfectly sliced pineapples, you should consider buying the Statko pineapple slicer. It is a durable product that composes of heavy duty stainless steel brushes. You can easily cut the pineapple in one go with this tool and it offers minimal wastage. This is a small yet highly effective device. Moreover, it prevents crushing of the pineapple slices leaving you with perfectly sliced pineapple. The pineapple corer by OXO is a famous brand used by many people around the world to de-core and slice pineapple. The measurement marking helps prevent piercing the bottom of the pineapple, which makes it easy to reuse the pineapple shell. The handle is non-slippery which makes controlling the corer much easier. 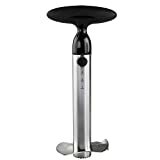 The OXO Good Grips Corer is one of the best pineapple corers that has excellent net customer ratings too. Out of the above-listed pineapple corer, we would suggest you to pick the OXO Good Grip Pineapple Cutter. The shaft made of full stainless steel body which makes this pineapple corer will last longer compare to any plastic models. The measurement markings on shaft help prevent piercing the bottom of the pineapple, and the best part is this corer can accommodate most of the pineapple sizes. No headache in owning multiple corers for different pineapple sizes. The handle of the OXO pineapple corer is soft, comfortable, non-slip grip and BPA free. Washing is a breeze as the handle can be easily detached from the shaft for easy cleaning and are dishwasher safe. The OXO Good Grips Pineapple Slicer is our pick as the best pineapple corer and also score a high grade for the net customer satisfaction ratings.